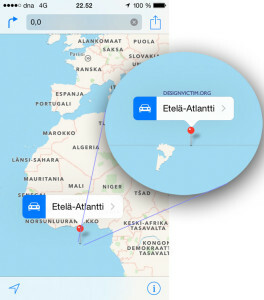 Design Victim » Apple has fabricated an imaginary Null Island into their map database? 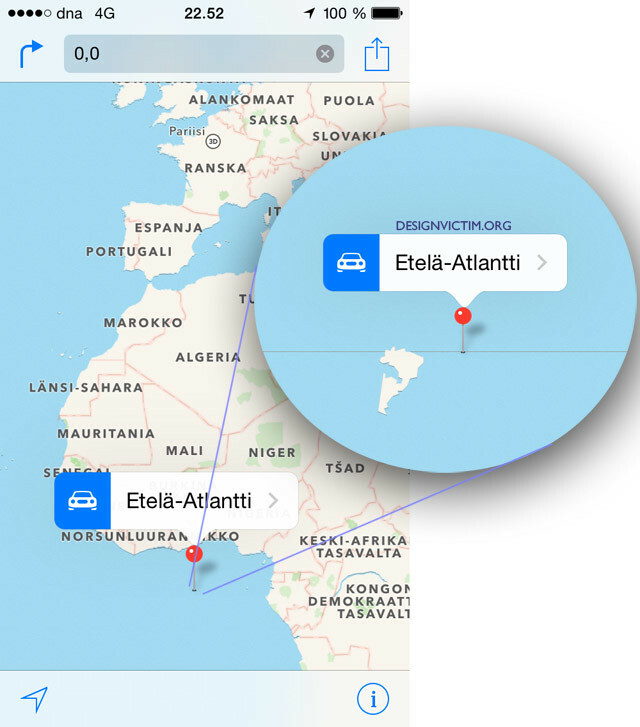 Apple has fabricated an imaginary Null Island into their map database? I wondered what is this weird-shaped island, where all the Apple GPS apps begin before any GPS signal is found. It shows on iPhone for a second or two, and then the map hops to the current location. Digging into it, I guessed coordinates 0,0 to Apple maps app – and there it is, after you zoom in some! A nameless island, right next to the coordinates 0,0! But… is there really an island in the middle of the Atlantic ocean, far south off the West African coastline? It’s not visible if you change to satellite view. It does not appear on any other map database I searched online. Googling some more, and Null Island concept is said to be a fun hoax – an island at the zero coordinates on equator and prime meridian. It seems Apple really has added an imaginary Null Island into their own map database! But why? My guess, it’s just visual information for coding people, so they have some recognizeable data coming in when the GPS starts. There probably isn’t any true harm to this. The Apple Null Island in the middle of the wide ocean. It’s not like anyone goes sailing only with an iPad? (Please don’t go sailing only with an iPad.) But in general, we find it harmful to common knowledge and common sense that someone tampers with maps that are used by millions of people every day. Probably someone argues over this in a pub, and checks settlement from iPhone maps – and both of them are misguided. It’s not anything people can go and see for themselves.